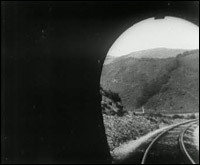 Early cinema held an instant fascination with the train, as is evident from the numerous actualities of engines entering and leaving stations, including the famous Lumière brothers film L'Arrivée d'un Train (1896). In the train, cinema found a technology to rival its own wonders, and early train films are often records of one modern technology marvelling at the other. It was a relationship that in a way began decades earlier; through the train carriage window, passengers were offered a cinematic experience years before the emergence of cinema itself. With the 'phantom ride', these two technologies were fused together to produce an all-new cinema spectacle. Phantom rides were films shot from the very front of moving trains. The films would present the journey from the train's perspective, capturing the approaching track, surrounding landscape and the passage through tunnels. To obtain these films, cameramen would literally tie themselves and their cameras to the buffer of a speeding train. From this position, the film would appear to be moving by aid of an invisible force, hence the name 'phantom ride' by which they soon came to be known. The first phantom ride, The Haverstraw Tunnel , was made in America in 1897. The concept quickly caught on in Britain and would become one of the most popular forms of early cinema. Since the camera in early films was usually stationary, phantom rides presented a dynamic new style of filmmaking. Although it was the speed, motion and unique perspective that were the primary pleasures of the phantom ride, the films' exotic subjects offered up a secondary thrill for audiences. Early British phantom rides were filmed along local tracks, but filmmakers soon became more ambitious and British cameramen were deployed around the world to film rides through foreign lands. In the same way, filmmakers came from overseas to Britain to record the exotic lands on our own doorstep. From the safety of a seat in the music hall, fairground or church hall that was the common home of early films, a British viewer could not only observe the world, he or she could also experience the unique sensation of travelling while sitting still. This, we can imagine, would have been particularly exciting when the train headed towards a tunnel, when the viewer would have experienced the thrill of rushing through darkness and bursting into daylight. As was standard practice at the time, the films would only last a few minutes at most, and would have been part of a programme of similarly short actualities, comedies and trick-films. But in 1906 a number of specialised cinemas, under the banner 'Hale's Tours of the World', opened across Britain, styling themselves in the manner of a train carriage and offering trips to 'the Colonies or any part of the world (without luggage!)' for sixpence. These cinemas took the realism of phantom rides to another level: the benches would shake and the images would be accompanied by the sounds of hissing steam and train whistles. In effect, the Hale's Tour is an ancestor of the sophisticated rides simulating space travel or flight in many fairgrounds and amusement parks today. There were four of these cinemas in London (two of them on Oxford Street), while others appeared in Nottingham, Manchester, Blackpool, Leeds, Liverpool and Bristol. As early as 1899, the single-shot form of the phantom ride was being edited into multi-shot films. G.A. Smith inserted a single shot of a man kissing a woman in a train compartment into Hepworth 's View From an Engine Front - Train Leaving Tunnel (1899), to create the three-shot A Kiss in the Tunnel (1899). The phantom ride concept was soon extended to other forms of transport, such as ships and trams, as in Panorama of Ealing from a Moving Tram (1901). Although single-shot phantom rides continued into the 20th Century, the phantom ride became commonly applied as one technique of many in edited films such as Scenes in the Cornish Riviera (1904) or the excellent A Trip on the Metropolitan Railway from Baker St to Uxbridge and Aylesbury (1910). In the cutting, however, the phantom ride lost some of the intensity of its original single-shot form. All the same, by 1910 the phantom ride was out of step with an ever more complex film style and, perhaps, with less easily impressed audiences.